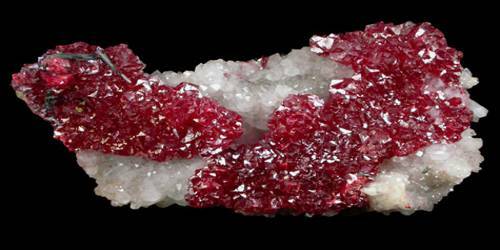 Cinnabar is a bright red mineral consisting of mercury sulphide, sometimes used as a pigment. It refers to the common bright scarlet to a brick-red form of mercury(II) sulfide, formula HgS, that is the most common source ore for refining elemental mercury, and is the historical source for the brilliant red or scarlet pigment termed vermilion and associated red mercury pigments. Cinnabar generally occurs as a vein-filling mineral associated with recent volcanic activity and alkaline hot springs. Cinnabar has been used for its color since antiquity in the Near East, including as a rogue-type cosmetic, in the New World since the Olmec culture, and in China since as early as the Yangshao culture, where it was used in coloring stoneware. Its cinnamon to scarlet red color can be very attractive. 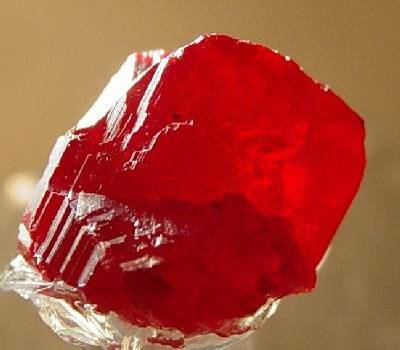 Cinnabar is generally found in a massive, granular or earthy form and is bright scarlet to brick-red in color, though it occasionally occurs in crystals with a non-metallic adamantine luster. It resembles quartz in its symmetry. The hardness of cinnabar is 2.0–2.5 on the Mohs scale, and its specific gravity 8.1. Cinnabar generally occurs as a vein-filling mineral associated with recent volcanic activity and alkaline hot springs. Cinnabar is deposited by epithermal ascending aqueous solutions (those near surface and not too hot) far removed from their igneous source. Cinnabar was mined by the Roman Empire for its mercury content and it has been the main ore of mercury throughout the centuries. It is associated with native mercury, stibnite, realgar, pyrite, marcasite, opal, quartz, chalcedony, dolomite, calcite, and barite.